Our online collage maker lets you weave your photos together to tell a story. If a picture is worth a thousand words, imagine what a collage can say. Our free collage maker is a beautiful way to tell your story with photos–from your travel adventures, memories with friends, family milestones and beyond. Whether you have tons of photos from a recent event or just a few throwback images that you want to relive, our online collage maker will arrange the photos in a memorable way. Online collage maker from Smilebox is an amazing tool to have in the age of selfies and social media. What can you do with all of those photos? The answer is to put your favorites into the free collage maker. Find an online collage maker design with a theme that appeals to you, insert your photos into the spaces, and add some text. The next step is to send your customized free collage maker design to all your relatives and buddies. The online collage maker has sharing options that include social media and email. With the Smilebox collage maker, you can share your creation with every single person appearing in your photos for an online activity like no other. One of the best features of the free collage maker is its ease of use, in just 4 simple steps. Choose a layout Online collage maker templates are designed in various ways to accommodate your preferences. Choose the layout that suits your taste, click it, and then click “Personalize”. Free collage maker gives you access to all of the images that you have collected on your phone, social media accounts, and computer. To see them, click “Add More Photos” in the online collage maker, which also has a photo well for storing various pictures. You can try them out in your customized free collage maker template to see which ones fit the theme the best. Online collage maker gives you plenty of options to finetune your creation. Most of the text can be edited, and you can also play around with different colors and fonts. Online collage maker templates are easily shared with relatives and friends. You can send your customized free collage maker design through email and social media post, or print it. 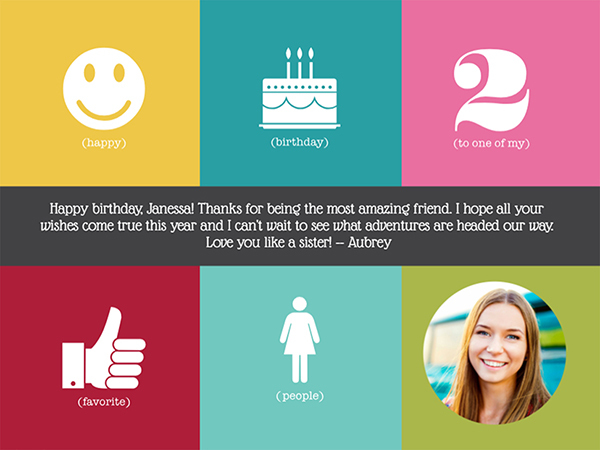 The online collage maker from Smilebox was created to enable easy personalization. The free collage maker platform has all of its tools on one page and uses actions like clicking and drag-and-drop to accomplish every customization task. Sharing your completed online collage maker is similarly simple. When you click the share button of the free collage maker platform, all the options for emailing, social media post, printing, and saving are front and center. Within moments after finishing your online collage maker design, it can be on its way to dozens of people. Online collage maker templates are available in layouts ranging from those that are set up for two photos to those that accommodate more than a dozen. That’s why you don’t need one photo that says it all when you customize the free collage maker. The dynamic effect created by multiple photos is an exciting way to get across your message. Free collage maker designs are also supplied with numerous themes. Holidays, personal celebrations, and everyday appreciation are just a few of the motifs for you to enjoy when you personalize an online collage maker template.